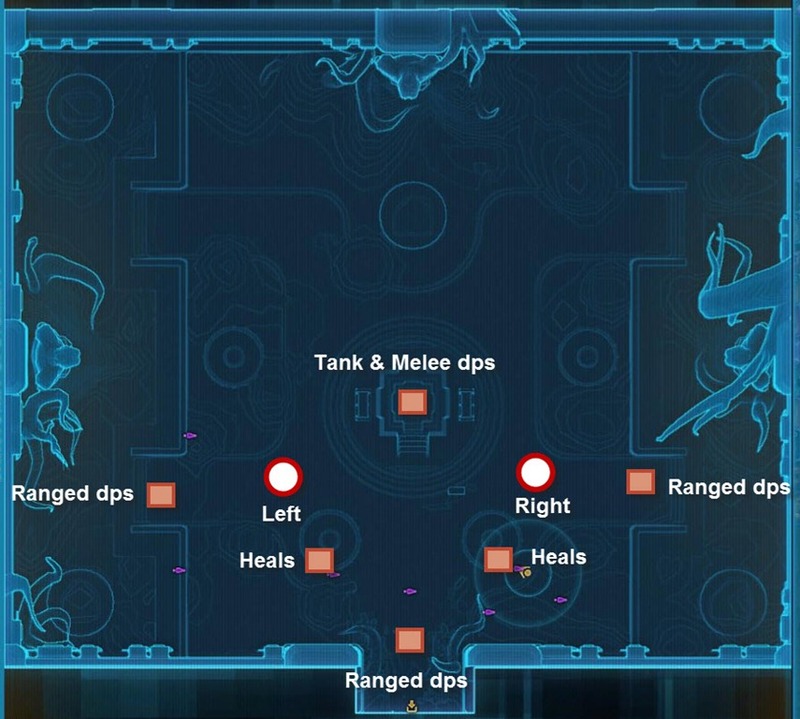 Note: This guide was written based on the last iteration of PTS. Fight may change on the live servers. Distorted Perceptions (red circle) now hits much harder and root you in place. Use defensive cooldowns and one healer need to focus heal. No big differences in the first portal phase. Left side crystal need to be cleansed and right side need to kill the add that is casting Mass Affliction fast. There is now a Guardian of Knowledge guarding the pedestals where you need to place the crystal. He respawns quickly so get him low and kill him right before you place the crystal. Inside the left portal where you need to retrieve crystal, abilities like roll, force speed, leap etc no longer works. There is an add that spawns that needs to be killed quick as it roots you. 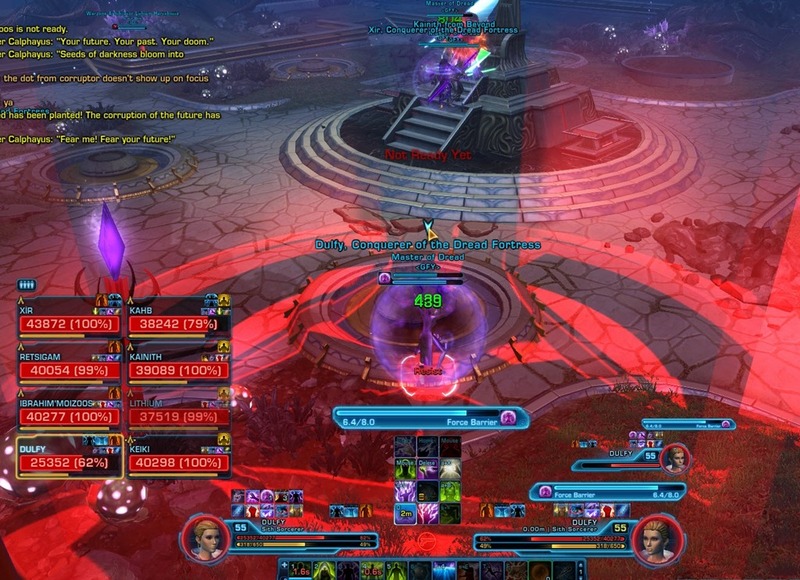 Distorted Perceptions (the red circle that is placed under a random ranged raid member), now ticks much harder (about 6k damage per second) and roots the person. Whoever has it should use defensive cooldowns and the entire raid should have “assigned seatings” so that one player’s circle does not hit other players. 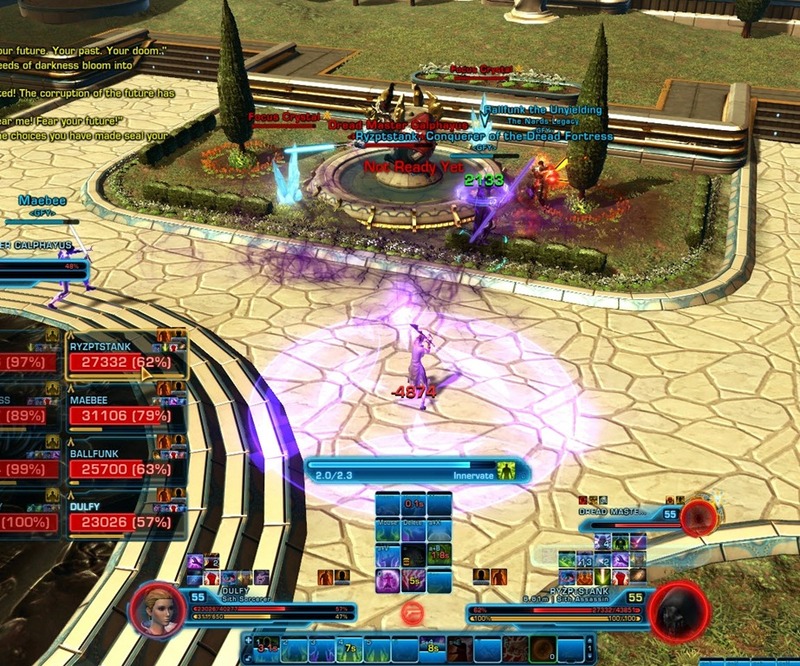 Sorcs/sages can use their Force Barrier to avoid pretty much all of the damage. 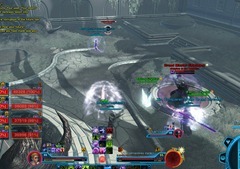 If a non sorc/sage get it, one healer should be focused on healing them while the other healer take care of the rest of the raid. The Portals to the present and past only open for 5 seconds so there is now very little time to get to them. 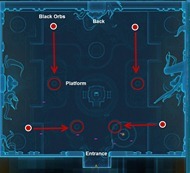 If you need to go to the left portal for example, you need to stay close to it without being nearing other players. The following is an example of “assigned seating” seating we use and may need some adjustment for your own raid composition. 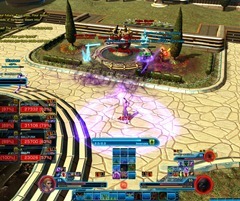 Notice that everyone is spread out but also close to the portal. No change inside the first portals from hardmode. Left side crystal may receive a DoT that deals very little damage but you may want to cleanse it as they may up the damage on live. Right side just need to dps the add down before he can get his mass affliction cast off. Second set of portals does have some major changes. There is a purple/pink circle on both sides that you need to avoid as it ticks for 3-4k damage otherwise. On the right portal there is a black orb called Empowering Power with 100k HP that you must kill before it reaches Calphayus. 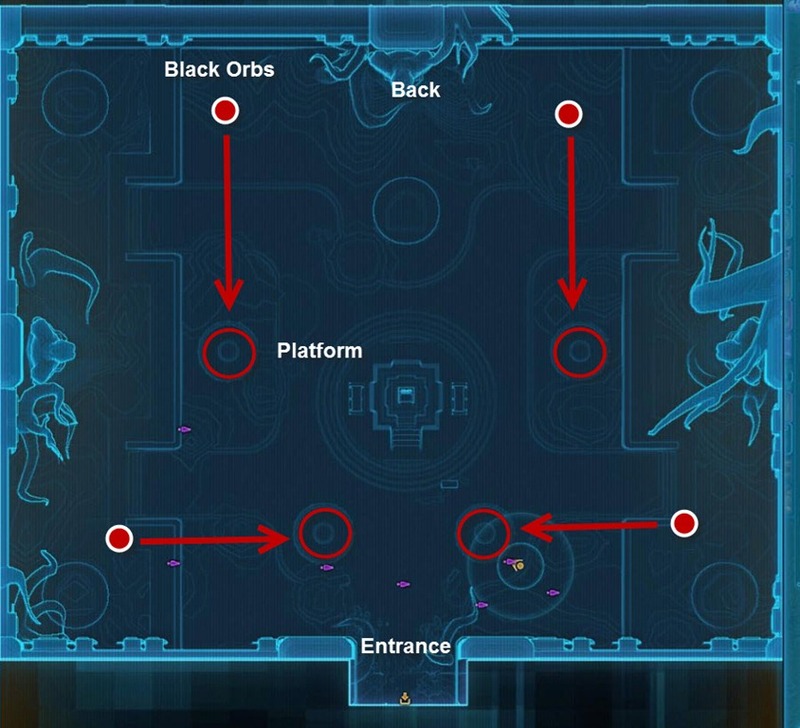 This is somewhat of a DPS race, especially with the platforms near the door as the orbs are coming from the side and have a much shorter distance. On the back platforms, the orbs are coming from the back wall and have a much longer travel distance. For the last phase, there are some changes as well. Outside the portal now spawns a Guardian of Knowledge with 108k HP. 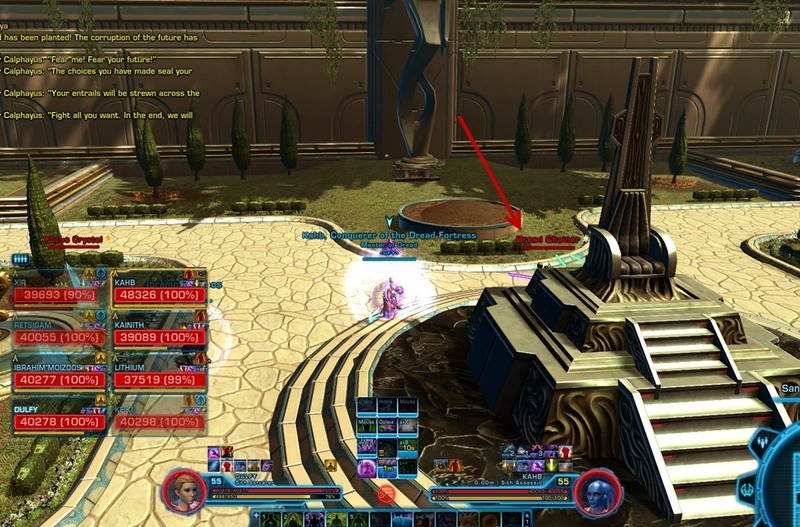 This guy respawns when killed and prevent you from placing the crystals on the pedestals. To counter this, have a group of players staying outside to damage the Guardian to about near death. 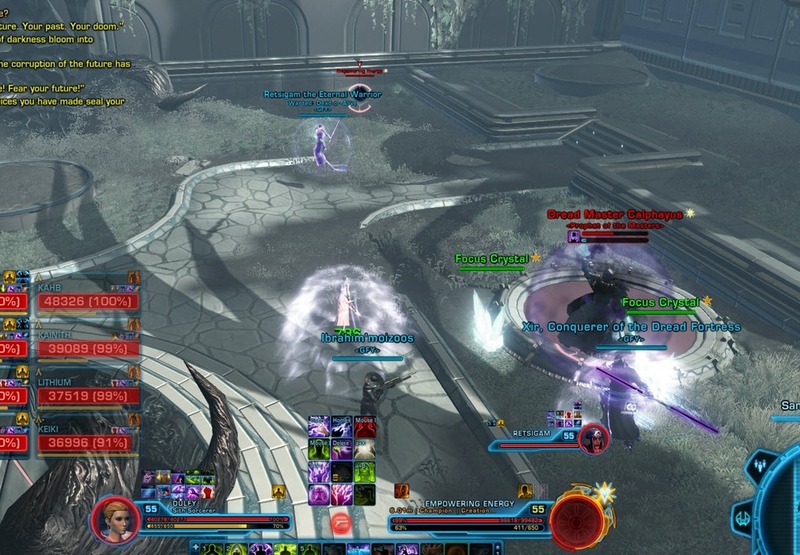 The group coming out from the left portal retrieving the crystal should be able to finish him off and place the crystal before he respawns. Inside the left portal where you need to retrieve the crystal, an add called Dread Chainer now spawns when the crystal is picked up and will try to root the crystal picker in place. 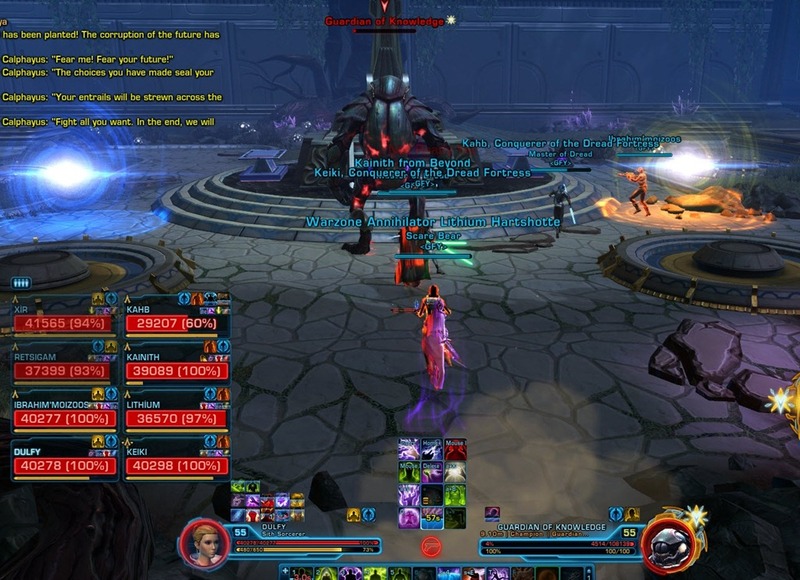 To counter this, it helps to have 2 DPS go inside with the crystal carrier so they can kill the add fast. Sorcs/sage can also pull the crystal carrier but you cannot use force speed/roll/leap etc. Hey dulfy, a question. 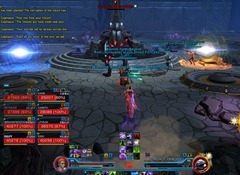 Currently we split our dps in a 1-3 split (saboteur slinger goes left and sage, hybrid slinger, combat sent right side). 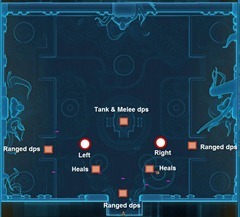 The reason for that is that on HM the DPS check was always on the right side 1st phase and left side 2nd phase. As a saboteur slinger I have little issues killing the adds on the 1st phase on my own. Is the orb always coming from the same side? Meaning, is precasting possible? Also a bit unrelated to the 1st question. But you say you can use a sage rescue. Is that from before or after the patchnotes where they supposedly fixed a lot of gapclosing abilities? Meaning, can shadows still use phasewalk ect? Phasewalk no longer works, sage/sorc still does. Orbs seems to always come from the same side depending on where the platform is so you can somewhat predict it. Question for those that play Assassins/Shadows: can you still Phase Walk with the crystal? I noticed it didn’t show up in the description, but I don’t know if that was just because you didn’t specifically use the example or because it does still work. Phasewalk doesn’t work I think. Did the mechanics for Bestia change for NiM? The reason I ask is that no where on the internet was I able to find anything about her. ahh okay thank you! for the reply. Excellent website you got here by the way love it! Should add there that u need Calph dead on both future and past on first portal phase for you to be able to plant the seed. Otherwise it won’t let you. You should add that to the key differences from HM to NiM. In case people still read this guide, it’s worth noting that, unless they changed it in 4.0, you can stealth out of combat with the seed and use rocket boost with it.